It’s Tom Lehrer’s 82nd Birthday! To celebrate his talent and influence on my life, I thought I’d share a few personal stories about one of my childhood heroes, as well as links to classic numbers from the 1950s and ’60s, such as “Poisoning Pigeons in the Park” “The Masochism Tango” and “We Will All Go Together When We Go” (In the 70’s, the producers of the children’s show The Electric Company persuaded Tom to come out of songwriting retirement to write educational songs such as “Silent E.”) When he fully retired a few years later, he commented that once Henry Kissinger won the Nobel Peace Prize, satire could go no further. While at Oberlin College, I wrote Tom a letter to see if I might work with him on songwriting during the month-long “winter term.” In the letter, for his birthday, I wrote him a parody of “So Long, Tom.” I began my letter with this sentence: “I first heard your voice 19 years ago, which is odd when you consider I’m 18 years old.” I explained that when I was in utero, my mother had attended a lecture on mathematics education that he gave at Harvard University. I learned that as funny as Tom was as a performer, as a math teacher he was rather dry, tending to avoid eye contact and reading out of the textbook. To this day, my father — a retired professor who taught the very same course at Harvard a year after Tom did — gloats about how he was funnier than Tom in the classroom. Ah, but could Tom sing “Lydia the Tattooed Lady” off-key and with as much enthusiasm as my dad?! There are limits to Tom’s genius. But I digress. Tom did respond to my letter — I’ve saved his warm, witty response, and perhaps will post it online some day. He wasn’t interested in devoting a month to my musical studies but did invite me to visit his home in Cambridge, Mass. We chatted for several hours about musical theater, trivia about his lyrics, and more. I’ll leave you with this gem. A few years ago, I learned that another hero of mine Stephen Sondheim went to the same summer camp as Tom Lehrer as a boy. To honor musical theater producer Cameron Mackintosh, the two reunited. Check out this delightful video. 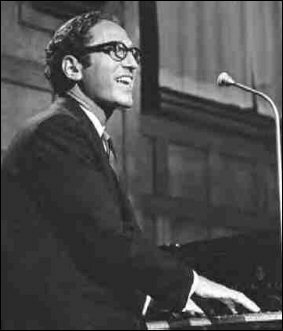 I’d love to hear any Tom Lehrer related memories you care to share. Happy Birthday, Tom! Here’s to many, many more! Posted in Catchall, Comedy, Jordan D. Brown, Satirical Songs, Uncategorized, Vatican Rag | Permalink | No Comments ». Add yours!